Summer Camps, Workshops during School Breaks/Holidays, Weekend Clubs, Online Clubs, Programming Contests, Custom Workshops & campus tour for schools, custom camps/workshops off-site for schools/groups, weekly after-school clubs in nearby schools, Teaching Training workshops, Career day presentations, FREE workshops to the community on MLK day of service, hands-on workshops for UTD students and professional development workshops for adults. and an army of UT Dallas students! We will get back to you within a day (within few hours most of the time). If you do not get a reply within a day, please send another email or call this number again. Please do NOT call or email anyone else in UT Dallas regarding our events. No one will be able to assist you – it will only frustrate them and you 🙁 Thanks for your patience and understanding! Latest surveys and news reports indicate that the US will continue to see a serious shortage of software professionals for the foreseeable future. So, computer programming is expected to be a high-paying & marketable skill for years to come. Even if you decide to pursue a career in another field, it is very likely that you will use a computer on the job! Basic programming skills can enable you to be more efficient in your job & try something new!! Almost every one can learn to program if they are willing to think and try. Yet, we see significant % of middle & high school students making career choices, without knowing the meaning of the term “computer programming!” Ok, how can you assess your interest level? How to check whether you have the mindset to enjoy programming? There is one simple way to find out – Jump in there, write a few programs and see for yourself! We are passionate about programming & problem solving techniques! We strongly believe that it is possible to introduce Computer Programming to all school students in an enjoyable way and enable them to consider higher education & career in STEM fields. There are several age-appropriate FREE tools out there that can help to learn programming at almost any age! We believe, with wonderful tools like Logo and Scratch, a typical 3rd grader should be able to start the journey! Here is a 15-minute video to explain this diagram: Learning to Program : Enjoyable Journey? Review all the tabs in this page to see the upcoming events. If you live far away & you want us to come to your location (school, workplace, coaching center, etc.) and conduct one day workshop or week-long summer camp? Write about your needs to [email protected] & we will work with you to make it happen! Also, let us know if you want a faculty to come and do a few presentations – we will be happy to do it!! Why do we run these events? – We want the school students, teachers and community to realize that learning to program can be enjoyable! We hope a lot of school students will become passionate about programming and select STEM fields for college degrees and careers. Since school students start to gravitate towards specific careers as early as middle school, we want to expose them to Computer Programming early and enable them to make “informed” choices. – We want to strengthen the programming skills of UTD students so that they can excel in their programming projects in their coursework and beyond. We also want to help them become industry-ready & enable them to get internships during school years and better jobs when they graduate. – We want working professionals to use us as a resource to update their skill sets so that they can do their jobs more efficiently and progress in their careers. Summer camps: Summer camps are primarily targeted towards school students, even though every one including college students, school teachers and parents are welcome to register and attend! Each summer camp runs for one whole week – we have added mornings/afternoons camps for Elementary kids. 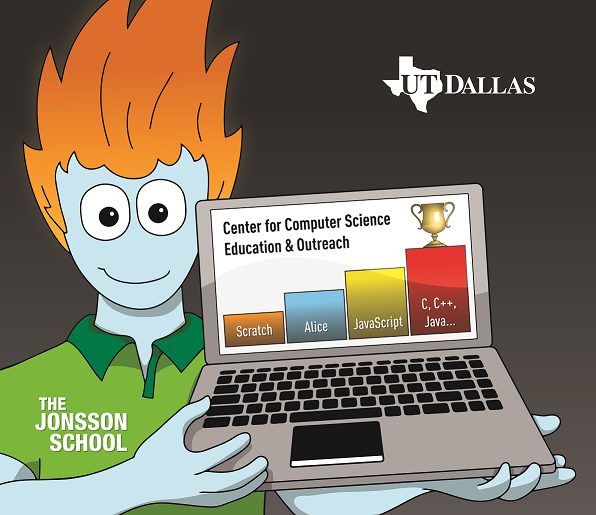 These camps will enable the participants to combine 2 camps in one week (programming camp with a chess/athletic/robotics camp) – UTD does offer lots of camps in Summer: Visit www.utdallas.edu/summercamps to see the full line-up! Each camp will be jointly run by well-trained & experienced UTD students with guidance from UTD faculty. Enrollment cap for each camp has been set to 20 participants to enable all the participants to interact with the instructors. You can expect the difficulty level to vary a lot from one camp to another. Review the camp description carefully before your register. If you are not sure, send an email to [email protected] to get clarifications. Please do not rush the school students through advanced camps – we do not want them to get overwhelmed and loose interest in programming. We want them to enjoy the learning process and progress in their own pace. Advance registration fee for each full-week camp is reasonable $300 until 2 weeks before the camp & it increases to $350 for the final week of registration (Advance registration fee for one week mornings/ afternoons camp will be $150 and it increases to $200 during the final 2 weeks). If we run out of space in any camp/location, we may close the registration early for specific camps/locations. If your plans change after registration & you need to cancel a registration, send an email to [email protected] $25 processing fee applies. Registrations are not transferable to another person, but you can transfer to another camp or another session of the same camp if it is offered in multiple weeks. Simply register for the new week/camp and ask for the refund for the original one. We can refund the fee only to the credit card that was used for registration – we cannot issue refund checks or credit to another credit card. Sorry! All the participants will get a Camp T-shirt on Monday, a completion certificate on Friday if they attended all 5 days and completed all the exercises. We plan to cater lunch for all full day campers (Pizza/Sandwiches/Indian/Chinese/Italian food entries). Unless stated otherwise, all workshops run for whole day (9 am to 4 pm). At least 2 different items from Pizza, Subway sandwich, Italian, Chinese and Indian entries will be served. A vegetarian option is always included. If you have a picky eater or your child has food allergies, do not take chances – please send lunch & snacks with your child. Directions: Visit www.utdallas.edu/k12/directions for detailed instructions and map to reach ECS South (ECSS) building where most events are held. Release forms: Release forms can be downloaded and uploaded @ bit.ly/utd-cc-forms. If you are bit worried about the open nature of UTD buildings/classrooms/labs (unlike a typical day-care with the locked doors), you are welcome to stay with your child for the first day or two. Alternatively, friends/families/communities can plan & register several kids together, then the parents can take turns to bring the kids to the camps & stay with them. Guest WiFi is available for adults to access the web while on campus. Let us know if you have any questions. Discounts for Camps/Workshops/Clubs/Courses: All discounted registrations are subject to audit & further proof may need to be submitted upon request. Improper use of these promotional codes or insufficient responses will result in cancellations. 40% discount for immediate family members of current UTD faculty/staff/students (use promotional code UTDFAMILY): This discount code is ONLY for Summer camps. UTD email address should be used to register. Otherwise, your registration will be cancelled – you will need to re-register again. 10% discount for children of UTD Alumni (use promotional code UTDALUMNI): This discount code is ONLY for Summer camps & Professional development workshops. Registration should be in the name of UTD Alumni. Degree, major and graduation year information should be provided as part of the registration – data will be validated with UTD Alumni database. Be ready to send additional proof if requested. 50% discount for families that qualify reduced rate meals at schools: You need to submit a copy of documentation from school to [email protected] to get the unique discount code (Families without such documentation should refer to income guidelines posted @ http://www.benefits.gov/benefits/benefit-details/1990 – you can send the first page of previous year’s tax return – you can erase/blacken/hide the SSN before sending us a copy). Then, you can proceed with registration and get 50% discount using that code. 90% discount for school teachers: This discount is only for teachers’ professional development. It CANNOT be used for their kids or students. School teachers should email a copy of school ID badge or another school document to [email protected] to get the code to register at lower rate. School email address should be used to register. Promotional code can be entered in the last page of registration. Only one promotional code can be used in a transaction. Submit the promotional code first, then pay the remaining balance using the credit card. If you have any difficulties in using the codes, email us at [email protected] . Thanks!